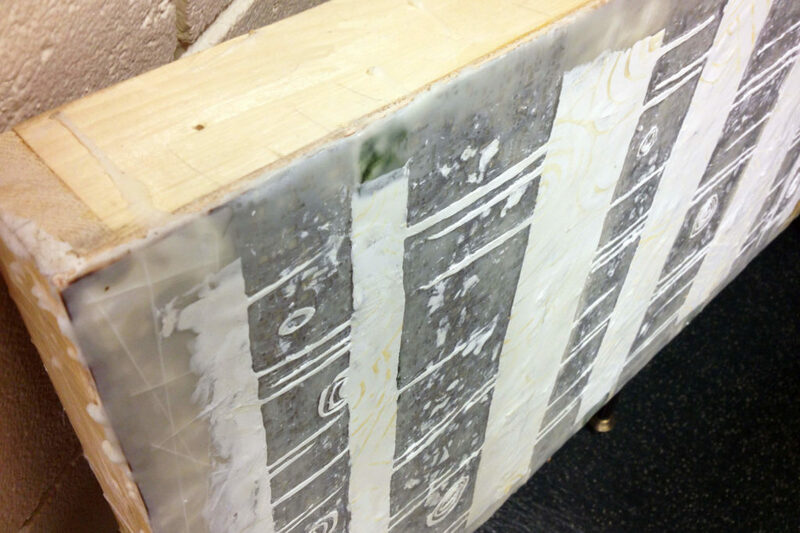 For the past three years I have dabbled in the world of encaustic art. 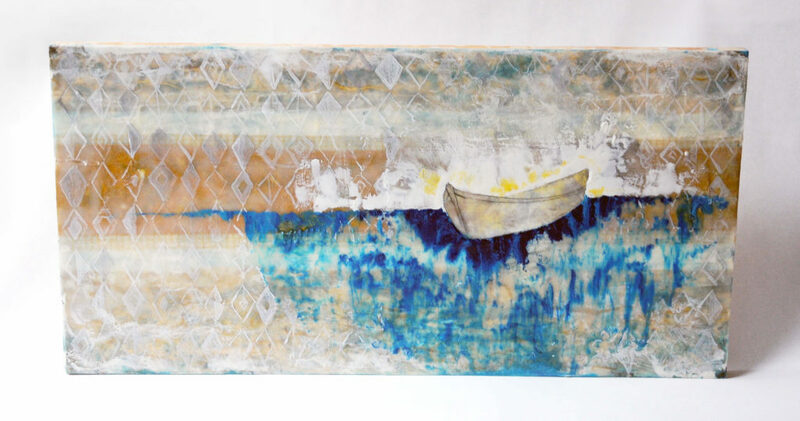 I began incorporating it into sections of my mixed media paintings, and slowly it became my primary medium. 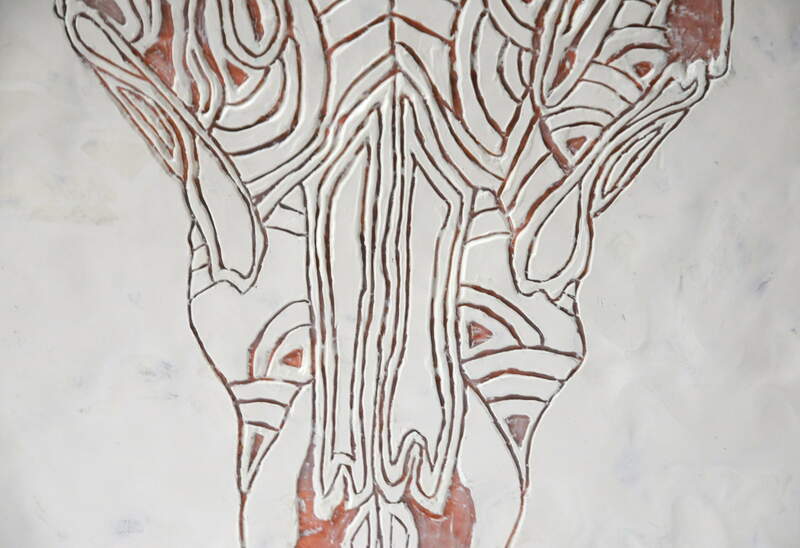 I have learned so much in the last three years, how to achieve smooth surfaces, how to manipulate the layers, and most recently, how to incorporate carving into my designs. 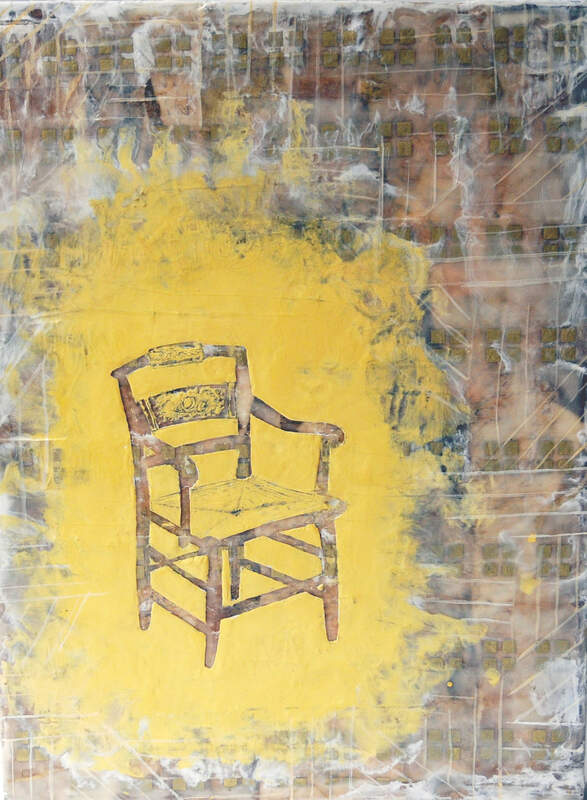 As I began working with encaustic, I primarily focused on black and white paintings of singular objects on top of collaged layers and encaustic medium. A water tower from my years living in Athens, ginkgo leaves from the tree at my Atlanta home, and images of chickens, among many other things, began finding their way into my works of art. I realized each of these objects represented a different piece of my past and present. They were self-portraits through objects, small snippets of the memories that make me up. 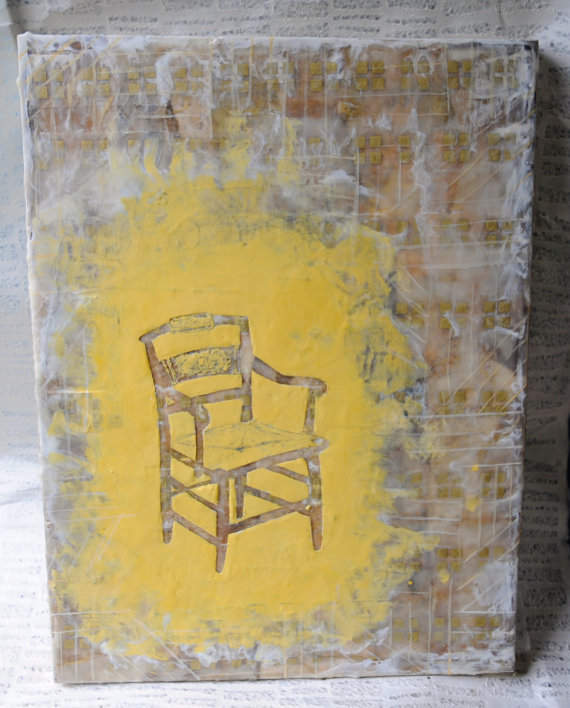 As I began exploring the concept of self-portraits and representing memories further, I realized specific objects would immediately come to mind as I reminisced on certain events and moments in my past. Likewise, when I saw certain objects, memories would begin flooding back. These fleeting images in my mind became the basis for my newest works of art, objects carved out of colored wax, revealing the collaged layers in the background. The lines and shapes of the objects are mimicked in the background, making them feel like one. The carving out of the objects, creating a negative space, represents the fleeting images that come to mind as memories are processed. I want the objects to almost feel temporary as the viewer looks at them. Perhaps my favorite part of my recent artistic journey, is hearing how my images have also brought memories back to the viewers who see them. As they take in the lines, shapes, and colors, they tell me how their grandfather used to have a camera like that, or how they used to live on a farm. 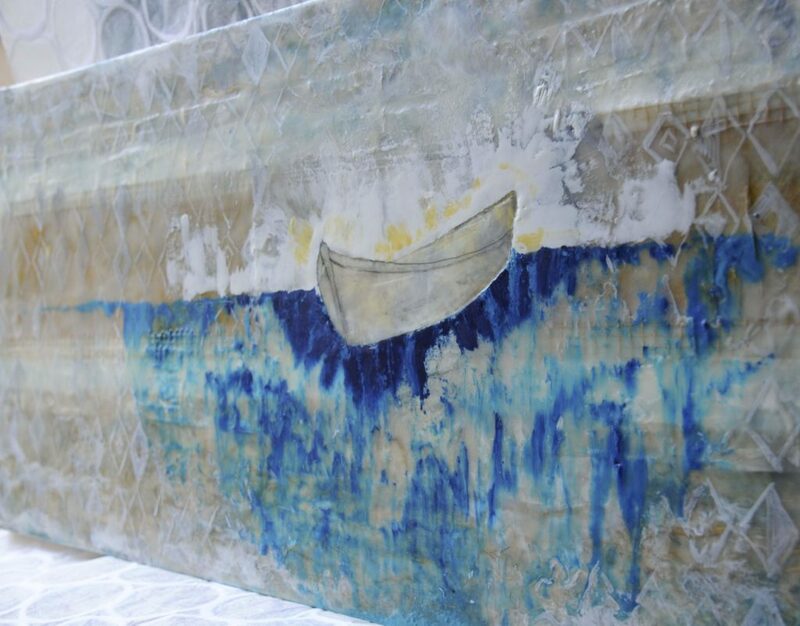 Their stories intertwine with my own, and continue to inspire these encaustic works of art. Thanks for taking the time to check out my blog! Help me spread the word about my art by sharing with others. Link over to your social networking site of choice! Thanks for stopping by. 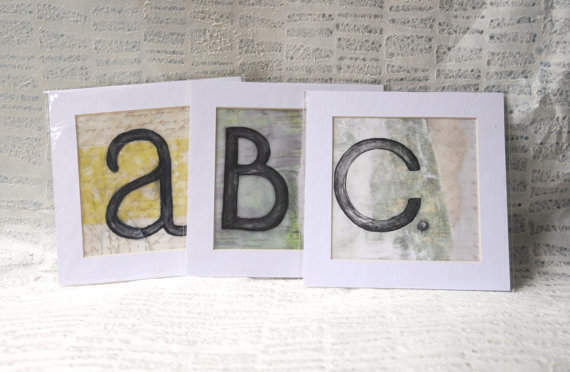 Over the last year I have been dabbling in creating encaustic letter collages. 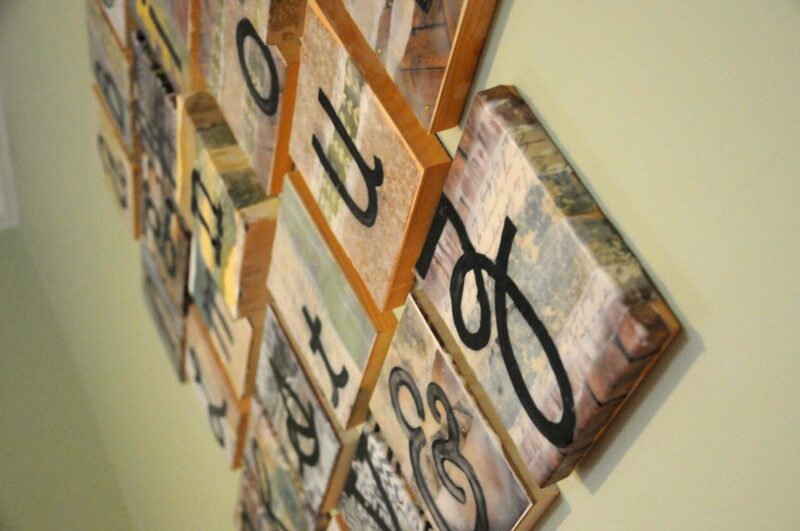 I love the idea of people hanging their initials, family members and pets included of course, in their homes. It is an easy way to hang a personalized work of art. After I began making my letters I decided to start with the most common, a’s, b’s, c’s, s’s, and t’s. I tried to predict what letters would most commonly be sold. What I quickly realized is I can’t predict the name of the buyers who visit my shop. I finally gave in, and put in a large order of wood panels. I decided it was finally time to create a complete alphabet. After I got started I realized how much space these small 6″x6″ panels took up. The best way to store them for purchase was to hang them on my wall. I was instantly in love. It was a fun, artsy, and educational addition to my office/studio space. I have decided that every time a letter sells I will replace it. It will be a great way to encourage me to create different styles of letters without the risk of creating too many and not selling them. Before they sell I scan each completed work of art into my computer and make prints of them. This has given me an opportunity to sell my letter paintings for cheaper, and to keep a log of past styles and letters. 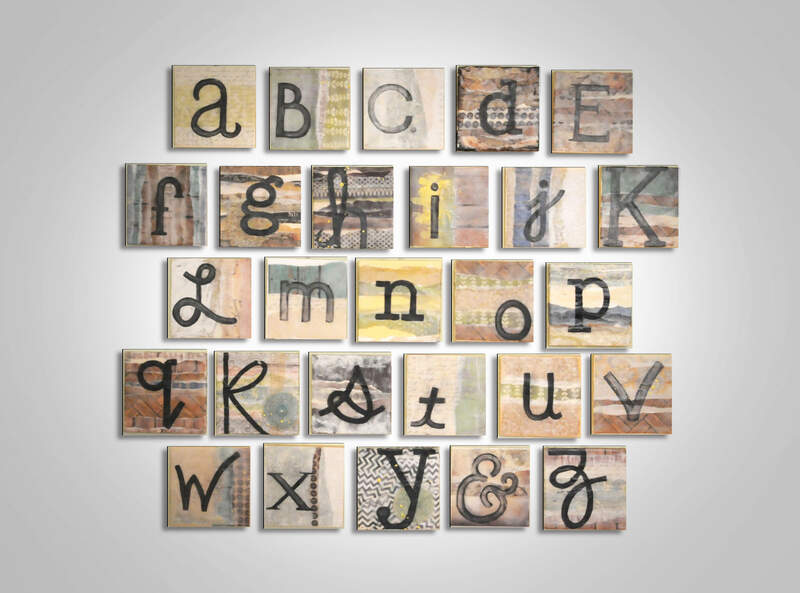 Check out my new custom alphabet listing here and my individual letters here. 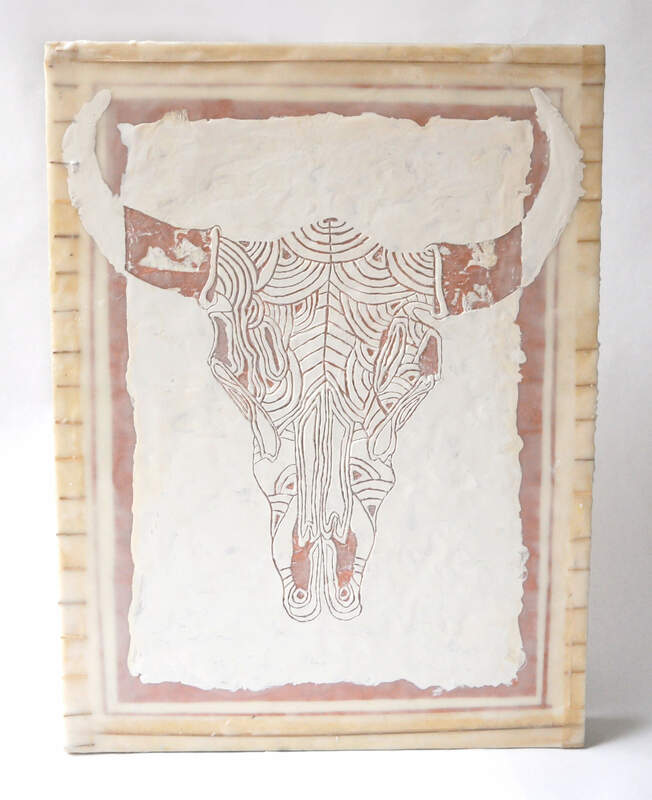 Thanks for checking out my shop and blog! Help me spread the word by sharing with others, I couldn’t do it without you. Thanks for stopping by! It’s the week I have been preparing for, for the last few months, it is Artist Market week! I’m so lucky to work at a school that offers opportunities to promote my artwork, like the Wesleyan Artist Market. Last year I felt very accomplished as I packed up my booth, a good 30 pieces shy of what I came in with. I hope to be just as successful as I was last year, and since then I have added a lot to my inventory. 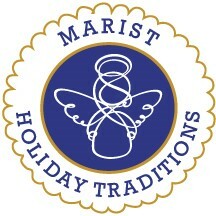 Here is a sneak peak of what I will be offering this year. Prices range from $5.00-$750.oo, offering a lot of options for all size and depths of wallets. With Mother’s Day rapidly approaching, and Father’s Day in the not too distant future, this market is a great opportunity to pick up gifts and plan ahead. Support local and handmade and come visit! 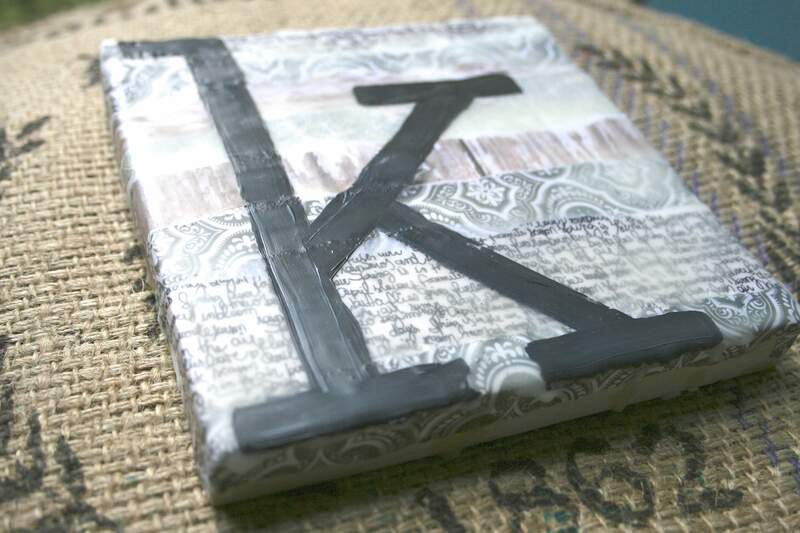 Last year my biggest seller were my encaustic letter paintings. 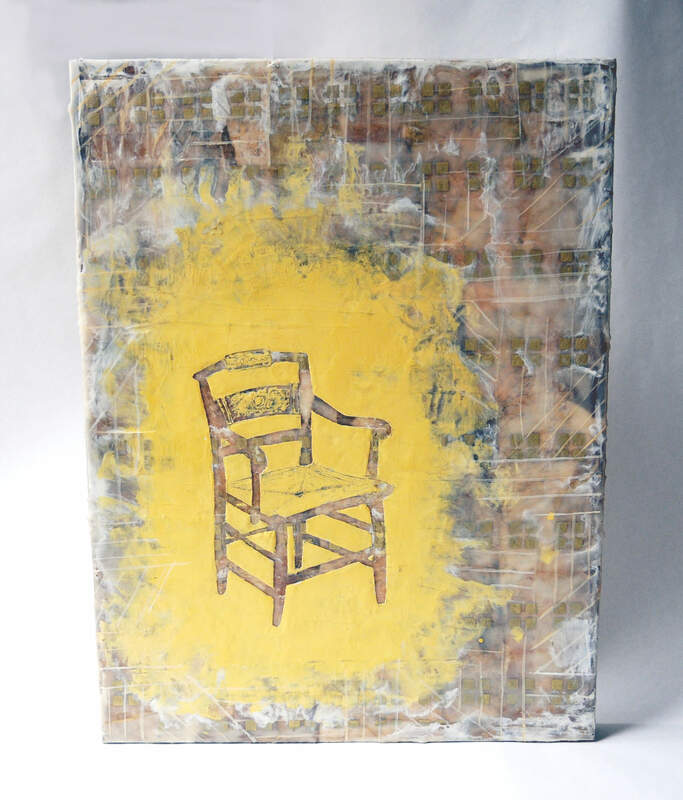 A collage of pattern paper, a layer of encaustic wax, and an oil painted letter come together to create these personalized works of art. Unfortunately, due to time constraints I was limited on how many letters I was able to bring in. On the first night all my vowels sold, which meant I could no longer display cleverly spelled out words. This year I started letter painting in advanced, and have the entire alphabet created. In addition, I have also scanned every single letter I made, and had high quality prints made. 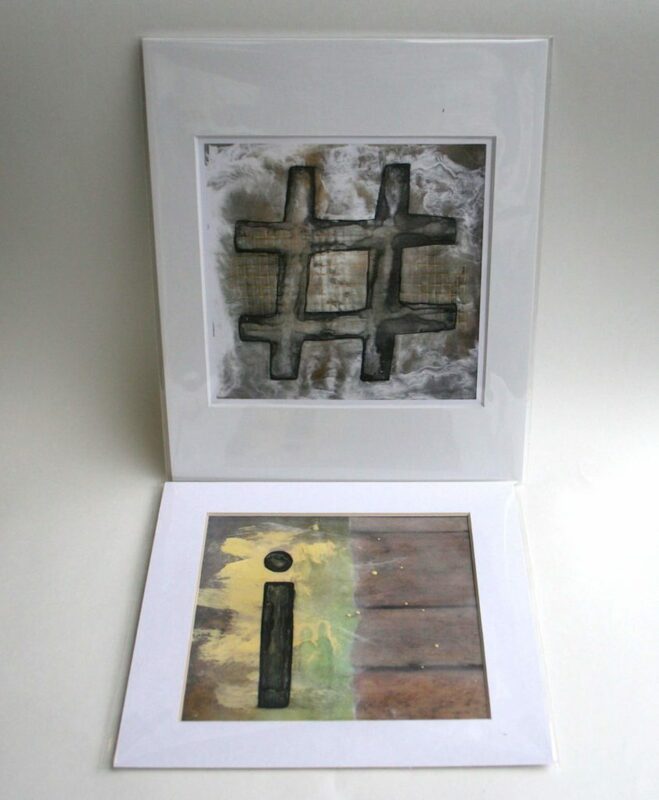 The prints are the same size as the original, 6″x6″, and are matted in either 8″x10″ or 8″x8″. I hope these prints will help meet the demand for the letters. 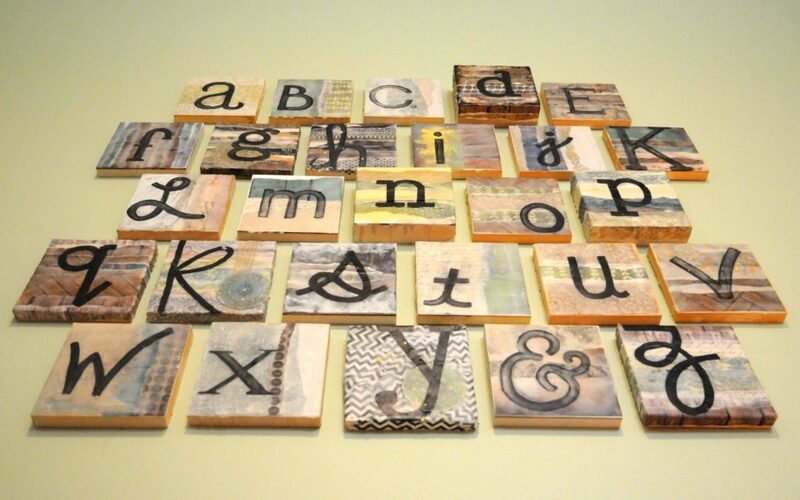 The $10.00 price per letter will also allow people to more easily buy a few, spell out words, or hang an initial for each member of their family. These prints will also make an appearance on my Etsy shop soon! In addition to the re-appearance of my letter paintings, I also have my 6″x6″ silhouette paintings, at $35.00 each. These were my second biggest sellers, and I hope the range of images I have picked will appeal to the crowd once again. I love to focus on old and vintage in these pieces. 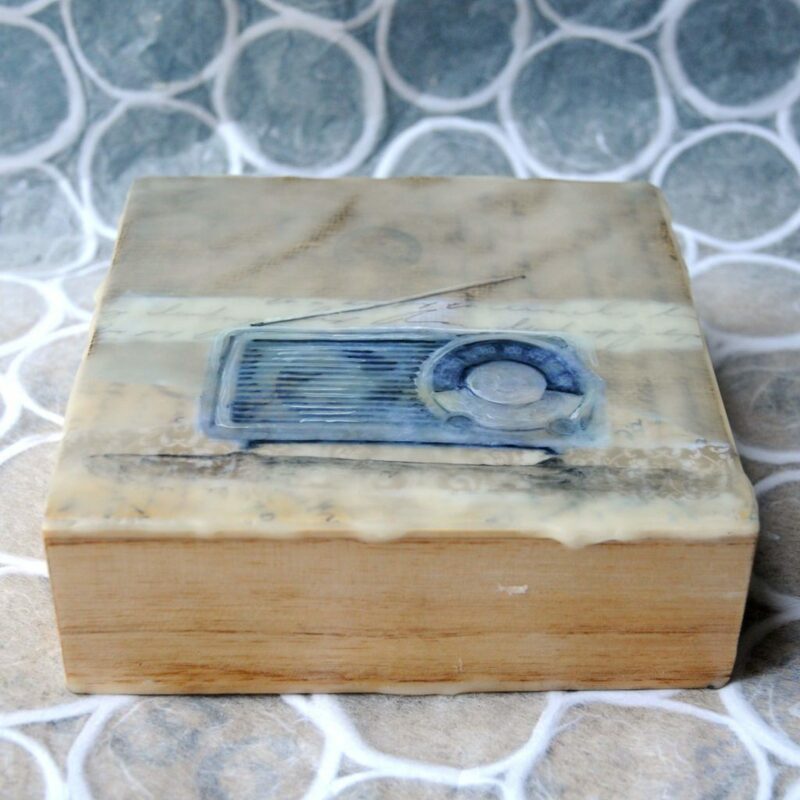 The encaustic wax inherently creates a hazy, dreamlike surface to my paintings, and the vintage items pair well with the wax. A new item I am offering this year are my re-purposed antique photographs. While at an estate sale I discovered an entire table full of 1920’s photographs. Something about the antique cars and stiff looking portraits appealed to me, and I decided to use them as part of a new encaustic series. 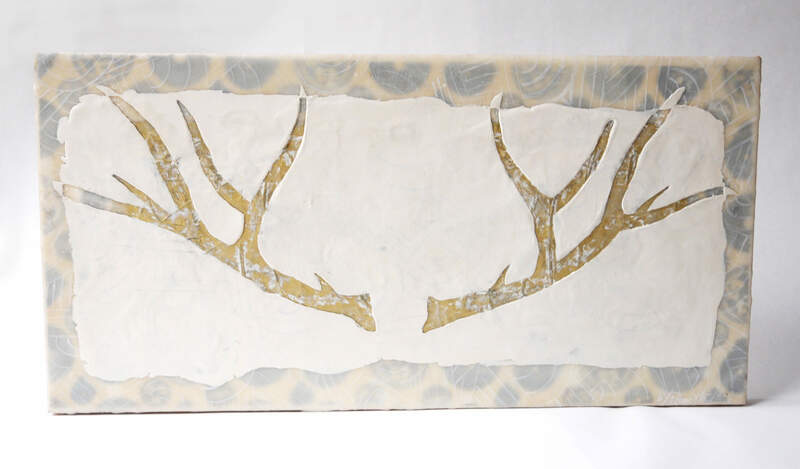 To create these pieces I layer paper, the photograph, and add a thick layer of wax on top. The hazy wax blends the layers of photographs and paper together, creating a cohesive look. In the future I envision the original photographs hanging next to silhouette transfers of the originals, with bright colors popping behind them. It will be a comparison of old and new, breathing new life into old photos. Be on the look out for these in the future! 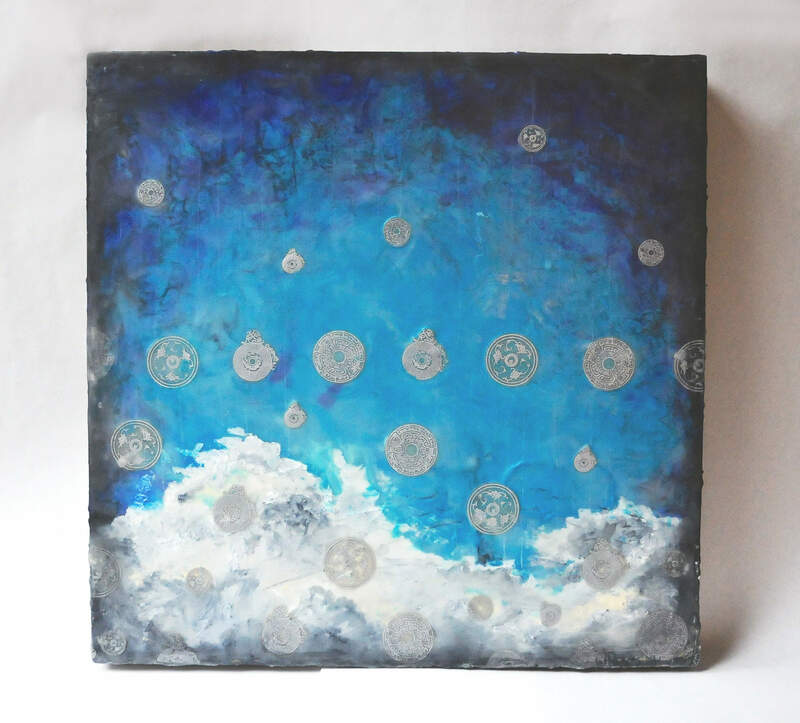 I will also have larger encaustic paintings, a few from last year and a few new ones. 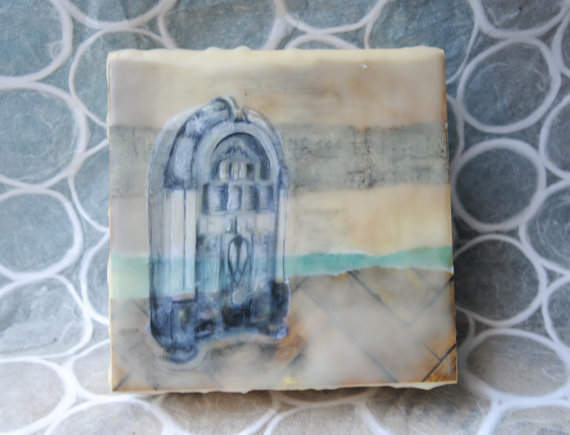 The new encaustic pieces I am working on focus on sketching. Lines are carved into the wax, and filled with oil paint. These range in subject matter from chickens to chairs, and range in price from $250.00 to $450.00. 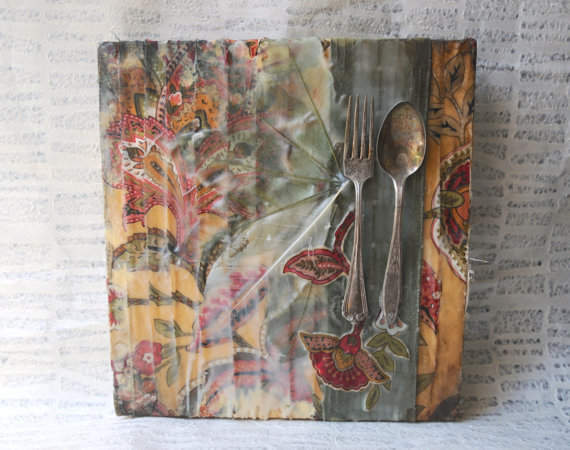 In addition to my sketch encaustics I also have antique silverware paintings, ginkgo leaf collages, and lots of birch trees! Like last year I will once again put out a handful of my fused glass pieces. I have my traditional geometric style as well as my new pieces, which incorporate my new obsession, glass paint. I have nest and birch tree themed plates and bowls using the paint to add the details. Whatever doesn’t sell this weekend will make its way to my Etsy shop, Sweet Celadon. I hope to see a nice crowd this weekend, I hope you stop by! Thanks for checking out my blog, help me spread the word by sharing with others! Check out the line up of entertainment and food trucks at the Artist Market here.